We've all seen those TV ads for the "Geniebra"? and the voice over says "don't waste lots of dollars on a bra that doesn'tfit" (or something like that), to which I always reply, (What!! We all talk back to the TV...) "no, spend lots of dollars on a bra that does fit. You'll be more comfortable and look better." Really, what woman in her right mind goes out and buys just any old bra, no matter how pretty, without trying it on, or at least checking the size tag. So do the right thing and get properly fitted or measured and buy what's suitable for your figure. And you'll have no need to waste your money on something that looks like a glorifiedelasticband. 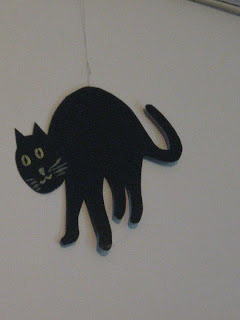 One year I came home from work one day to find Halloween images cut from black plastic and strung across one wall of the living room. and a Ghoul hanging in the carport. Behind the ghoul and at other points in the carport there were bats and cobwebs. I have made a remarkable discovery! Back story: a section of my left thigh has been sorely aching for some weeks now. that part of my thigh gets pressed against the table leg. The thing I remember most about March 16th, 1990, is the BlackVelvet. Not a dress, not even a piece of fabric, but asense, afeeling. It was the day of my hystercetomy. My operation had taken hours longer than expected as the surgeon found more and more invasive pre-cancerous lesions, so just kept cutting. I haemorraghed badly, requiring two complete blood transfusions* and had to be revived once. I was expected to surface from the anaesthetic about four hours after being moved to the recovery room, but I didn't. I stayed under until the next day and scared everyone silly. The very first thing I became aware of was the soft, velvety blackness that my mind had been floating in. I felt warm and safe and desperately wanted to stay there, so sank back into unconsciousness. But the machines recording my life signs had alerted the nurses that I was finally waking up. Colour? I hear you saying it. Who doesn't remember those oh-so-stylish avocado kitchens? But this is about the fruit. Many years ago, before avocados were the popular everyday item they are today, they were seen as "health food". Back in the days when health food was something only the fanatics or hippies ate. I read and was told they're good for you. Low calorie or some such. You should eat them. They're good for you. Try one, they're good for you. I remember once a friend gave me a small chunk from the one she was eating. I tried to eat it, which meant I put it in my mouth and immediately wished I hadn't. It felt wrong, tasted awful. I spat it out and apologised to my friend. Vowed to never try that again. Now, we all know I've got a very sweet tooth. Yesterday's bus ride to town was....interesting. It was a type of bus I'd never been on before, not a new one though. All the seats were too high, fine for regular people, not so good for the rest of us, so about 98% of the population, my feet didn't reach the floor properly, just my tippy-toes. There weren't many of us passengers at that time of day, but all of us were over 50, with me being the youngest on board I think. (Unless there were people at the back that I didn't notice). Anyway, the ride was jerky. Veryjerky. Either the brakes were "grabby", or the driver was stomping on the pedal too hard. We all spent the ride grabbing for support and bobbing around like corks in the ocean. My neck was not happy. Bus route, bus number, time of travel, where from, where to. Christmas is coming up way too fast for my liking. I started thinking of Christmases when I hadn't been working at Coles. Years ago, I worked in a shoe factory. Clarks Shoes. Yep, the one that makes all those kids school shoes and baby and toddler shoes too. All year, the bosses would bring in the orders and we'd jump through hoops getting them made and sent out. Christmas was a different story. Orders still had to be got out to the shops, but we'd be closing for three weeks, so there'd be a bit of a rush going on. But the atmosphere underwent a bit of a change. Tiny Christmas trees began appearing on people's work desks. Tinsel got strung around the machinery. Inside the EasiYo maker is a plastic 1kg container with a screwtop lid. This is what you mix the yoghurt base in. The instructions tell you to half fill this container with cool drinking water, then pour in the yoghurt base. At this point you can add 2-4 tablespoons of sugar if you wish. I added sugar the first few times - 3 tablespoons - then gradually cut down. This last batch has only one tablespoon. I use a whisk to mix in the powder, others screw on the lid and give it a good shake. Top up the container with more water, screw on the lid and give it a final shake up. Sit the yoghurt container inside the maker, screw on that lid, then leave the whole thing to sit overnight, or all day if you make it in the morning. And there you have it, your own homemade yoghurt. Making your own yoghurt, the EasiYo way. because I have waited WELL OVER AN HOUR for the second picture to upload and frankly I don't have that kind of time to waste. I have blogs to read, comments to leave, a book waiting on the coffee table, a new episode of The Big Bang Theory on TV tonight. Do you suppose this is happening because we've stayed with the current version of blogger instead of switching to the latest upgraded interface whatever thingy version? The thing is, I'm happy with this version, (well, I was....), why would I change? Often as newer photos are added and used, these older files get forgotten about. They lie dormant on our hard drives, quietly singing to themselves, "what about me, it isn't fair..."
Well, here's your chance to use those forgotten photos. Have a gander through all those old files and choose one or three or more that heve been there "forever" but unused. You know, because a better idea came along. because this wonderful concept is hers. Then hop on over to Kim's, add your name to her linky list and leave her a comment. I've been trying to put up my sunday selections post. I started doing it last night, only to have the computer stall time and time again when uploading the photos. Finally gave up and went to bed at 2am. Woke up at 7.30 this morning and tried again. Turned it off and cleaned my shower. Turned on and tried again. Well, this is no better. I'm shutting it all down again and going to the shops. I have a couple of prescriptions that need filling. I'll give it one more try later this afternoon. After I've run it through a defragmentation program. Unusual for me, I know. People don't stay over at my place. People visit, drink coffee, go away again. Anyway, last night just on dusk, there was a knock on my door. A young man I know rather well, with his own young son. Can we come in? We need a few hours down time. Clearly both were a little stressed. Maybe more than a little. To the point where two days ago, the young boy found a way to sneak out and run for help. Running from neighbour to neighbour, desperately knocking on doors, until one let him in and called the police while the boy tried to calm down. Well, the police spoke to him, calmed him down, then located the father who was at work. He took the boy to a friends house to stay for that day while he went back to work. After that the boy stayed with his dad, who wasn't at the family home anymore. Have I posted this recipe before? I don't remember and I'm too lazy to go back through my archives and check. fresh out of the oven, you can see there's plenty of sauce (gravy?) around the wings because I only bought one kilo instead of the usual two. With two kilos, the wings get that lovely browned barbecued look. I added carrots, because I like them in this. On my plate with a potato-broccoli mash. 2kg chicken wings or drumsticks1 large onion, sliced1 teaspoon mustard powder1 teaspoon curry powder1 teaspoon oil2 teaspoons soy sauce2 tablespoons lemon juice2 tablespoons apple cider vinegar1 tablespoon sugar1 cup tomato sauce. I have to say, I'm tickled pink! 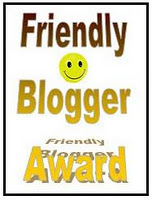 To accept this, all I have to do is link back to Delores, then award this to other bloggers that I think deserve it. You're allsuperfriendly, so take this award, please. I don't feel very good about myself right now. I did something completely out of character. A few weeks ago, I'd bought a couple of lightshades to put up in the flat. From their available store stock. Pretty things, one for the kitchen, one for the lounge. But I couldn't fit them and returned them. Then I chose a simpler pair of lightshades from their catalogue. and what I'd ordered was just plain coolie-hat shaped, brushed nickel outside, white inside. But I couldn't fit them to my fittings. So today I went there after work to return them. The manager said he was sorry, he couldn't keep ordering things that people didn't want and couldn't refund my money. Keep ordering? As far as I know this was the only time I'd ordered anything. I had to be up early this morning if I wanted to be at work on time, (and I did, I have a good track record there), so I thought I'd watch the JeffFoxworthyShow while I ate breakfast. I haven't seen it in yonks, and Jeff is funny. So after the fastest shower in history, (my history, not world history), I turned on the TV at 6am to find a commercial playing. One of those info-mercial type things. We've all seen this? Remarkable little machine that does everything a blender would do? I cooked and ate breakfast, took my vitamins, drank my juice, read a few pages of "The Big Issue", washed my breakfast dishes........the damn thing was still going!! Often, as newer photos are filed and used, these older files are forgotten. They lie dormant on our hard drives, quietly singing to themselves "what about me, it isn't fair.."
Have a gander through all those old files and pick a few, (or just one), that have never been used, you know, because a better idea came along. Post them on a Sunday under the Sunday Selections title, then link back to Kim at Frog Ponds Rock, because this wonderful concept is hers. Then hop on over and add your name to her linky list, leave her a comment too. She loves comments as much as we all do. Words that read the same backwards and forwards. We all use many of them. But how many of us notice numericalpalindromes? I like numbers, so when I see these, my mind does a little happy dance. Many times at work, when I'm totalling a customer's purchases, the sum will be a numericalpalindrome. Dates too have their palindrome list. This year for example, we have the eleventh of November. so of course it's raining. I'll still go out and pay my rent, but I don't know about the other stuff. They can all wait for a dry day. So here I am on the couch with my feet up, talking to all my friends. Need some milk too.....and bread......I don't think there's any vegetables in the fridge either. Well, there is one onion. Damn, gotta go out in the rain after all. Wish I knew what was going on, but I'm so glad to be back here. I had a message from blogger asking me to verify who I was, which I did, and then I was able to access the blog again. I'm sure you're all just as happy as I am, I'm grinning from ear to ear. I arrived home from work totally knackered, so took a nap, then woke up to a text message from my daughter K, aka no-one, who wanted to know if I had removed my blog. Well of course I hadn't, why would I? I love blogging and putting up photos etc. I love receiving comments. I love all the friends I've made out there. So I got out the computer and tried clicking on my link in my "favourites" list. This blog has been removed. I did a google search - nothing. I've left a question on the Blogger Help Forum and I'm waiting for replies. I've accessed this page through the BlogList on no-one's blog and I hope this post goes up. And I'd like my blog to be back where it was. (With all previous content in place of course). Baked in a 12 cup muffin pan. It's a non-stick pan, so I didn't think to grease the cups even a little bit. Then I allowed the fritters to cool in the pan. ...but they were still tasty. Well, there kind of isn't one. Let's see, grated carrot, finely diced onion, quickly stirfried, let it cool, toss in some grated zucchini, set aside. Make up a "pancake mix" with less milk, an extra egg, and a sprinkle of white pepper. Stir in the vegetable mix, pour into the muffin pan cups, bake until cooked through. I skewer tested at twenty minutes and they weren't done yet, so back in they went, eventually being done at about thirty minutes. I had the oven set at 180*C.
Very much a "hit and miss" recipe. I'd never made these before and I may not make them again. Heck, I've been waiting all weekend! Two weeks ago, channel nine started advertising the new season of The Big Bang Theory. LOVE, LOVE, LOVE The Big Bang Theory. Love all the main characters. Sheldon, Leonard, Howard, Rajesh, Penny, Amy, Bernadette. Stuart, who owns the comic book store, Kripky, from the university, Zack, one of Penny's ex boyfriends. I was impatient for the new season to begin. So last Friday when they finally announced the time slot, I flipped through the TV Guide to the correct page and drew bigpinkcircles around "7.30 - to be advised"
Yes, I have a pinkpen and it writes with pinkink. All day at work I couldn't concentrate properly. Hayfever and a headache may have had something to do with that. So, tonight at 7.30pm the new season started. Not just one new episode, they played two!! 'cos the times they are a'changing..
As you'll all notice I've switched to a pop-up comment window. Apparently pop-up comment windows are the ones that people are able to leave comments on, not the embedded below post ones. Since I love my comments, I've made the switch. Go to your dashboard page, select settings, from the tool bar across the top (in your settings seection) choose comments, then scroll down to where it has the selection for the type of comments box you want. Click the little circle that says pop-up box, scroll down to "save settings" and wait while it makes the change. Then you're finished and your blog will now have a pop-up comment box. As bloggers most of us have built up picture files of photos we think we might use "one day". They lie dormant on our hard drives, quietly singing "what about me, it isn't fair..."
Well, here'syourchance to use these forgotten photos. Have a gander through all those old files and pick a few, (or just one), that have been there a while but not been used. Post them on a Sunday, under the SundaySelections title, then link back to Kim at frogpondsrock, because this wonderful concept is hers. Then hop on over to Kim's and add your name to her linky list, leave her a comment too. I've chosen a random selection this week, just as a change from my usual themed style. Hi JahTeh, I think you'll get a smile from this. I spotted it from the bus the other day and when I went the same way again later in the week, (okay, today), I had my camera ready. Got off at the correct stop and took thesephotos. You don't see many brickouthouses these days; even in the past most were galvanised iron or wooden structures. I bet they wouldn't have lasted as well as this brick one did. I wonder if it is still in use and whether it is still a toilet or just a handy storage space. Sleep in, have a leisurely coffee. Wander off to the post office where I pay my rent. Then home again, where I noticed the roses had new flowers so I cut a few for my kitchen. Three yellows, two reds and a beautiful pink edged cream one. Then, I spent a couple of happy hours wandering around in my front garden. Of course we all know it isn't exclusively mine, but let's not get bogged down in technicalities. I can see the whole front yard from my door and window, so that's good enough for me to call it mine. 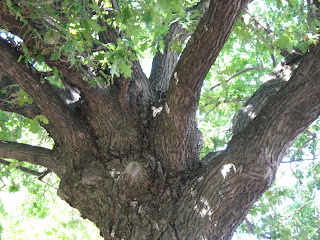 I pulled on my new gardening gloves, got out my recycling tub, the new secateurs, the new pruning saw and went to work. Deadheading the roses, sawing off a lot of dead wood from them, pulling out odd bits of grass and some young thistles here and there. I have to tell you though, most of these are oldfashionedrose varieties, with thorns. Anyone who has been reading here for a while knows that I live in Adelaide. So I'm wanting replies from other Adelaideans. Of course you interstate people can chip in too, but I don't think overseas answers will be much help. How many of you remember those LavaLamps that were so popular way back in the 70's? I have a son who loves those things and I'd like to buy him one for Christmas this year. I'd prefer a brand new one, but I don't know where to get one. I've tried places like K-Mart, Target, Cheap-as-Chips with no luck. Where in Adelaide, (or possibly Melbourne, Sydney, other cities), can I buy a Lava Lamp? It's raining here in Adelaide. Not a lot, but enough to wet the ground and need an umbrella. Today's rain was more of the misting down kind, at least it was while I was waiting for the bus. As the bus pulled up, I closed my umbrella in preparation for getting on, but the driver was a tad slow in opening the doors. So my hair got misted on. Just enough to make it frizz. I spent my entire shift at work with my head looking like I was wearing a steel wool wig. Luckily there are no mirrors at the checkouts, so I couldn't see myself. .....foisted upon us many years ago by our government for the summer months, has gradually been extended until it now covers all of spring, as well as summer. As far as I'm concerned, that's waytoolong. I wasn't happy with the original short arrangement, I've never been a fan of daylight saving. Now that I have to put up with it for a fullsixmonths, I may just go crazy. Since I already went crazy with it last spring/summer. Apparently it's to give people a chance for more of a social life after work. Now, correct me if I'm wrong, but didn't people somehow manage to have perfectly satisfactory social lives before daylight saving was even a thought in someone's brain? Really, if people want to socialise, they'll do it. Whatever the weather or the time on the clock. This idea was brought to us by Kim of Frog Ponds Rock, who realised one day that she takes many more photos than she uses, as we all do, and wanted to post some of the older ones on her blog. An old pub balcony; the lower part of the building now houses several specialist shops. Pub balcony in the city. This one is my favourite. This picture didn't load. Possibly it will show when the post goes up tomorrow? Row upon row upon row..